The PZL-104 Wilga 35A is a single engine, four-seat, highwing, general-pupose STOL aircraft built by PZL (Patowe Zaklady Lotnicze) "Warszawa-Okęcie". Studies for a four-seat general-purpose monoplane as successor of the in Poland under license built Yakovlev Yak-12M and the PZL-101 Gawron started in the late fifties, and resulted in the early sixties in the designing of the PZL-104 Wilga (Thrush or Golden Oriole). In 1961, production of the PZL-104 Wilga prototype started and this experimental Wilga 1 flew first on 24 April 1962.This experimental prototype was powered by a Narkiewicz WN-6 six-cylinder horizontally-opposed engine. The Wilga 1 prototype exposed a number of serious design faults, that resulted in an airframe review that thoroughly redesigned the aircraft. Retaining major structural elements and successful sub-assemblies from the cantilever wings in the initial design, a completely new slimmer, strengthened fuselage was added that also offered an excellent rear view aspect for the crew during glider towing operations, and the side doors were re-engineered to open upwards for better aero observation or parachute jump sorties. The prototype of the redesigned PZL-104 Wilga 2 flew first on 5 August 1963. Five versions of the Wilga 2 were projected, including the Wilga 2A glider-tug; the Wilga 2P general-purpose fouw-seater; the Wilga 2S ambulance; and the Wilga 2R agricultural aircraft. A version added was the Wilga 2C, the export variant with a 225 hp Continental O-470 engine proposed to manufacture under the name Lipnur Gelatik (Rice Bird) under licence in Indonesia as in 1961 a contract was signed between PZL- Okęcie in Warzaw and Lembaga Persiapan Industri Penerbangan (LAPIP) in Bandung concerning the production of the PZL-104 Wilga in Indonesia. In fact, the prototype PZL-104 Wilga 2 was followed by a short production run Wilga 2 variants, later converted to the Wilga C and Wilga 3 configurations. With the PZL-104 Wilga developing over the years, the aircraft was in continuous production from 1962 to 2010. The main variants of the PZL-104 are the Wilga 2, Wilga 3, Wilga 3A, Wilga 3S, Wilga C, Wilga 32, Wilga 35, Wilga 35A, Wilga 35H, Wilga 35P, Wilga 80, PZL-104M Wilga 2000 and the Lipnur Gelatik. In service since 1967, it is Poland's most successful light aircraft development with over 1000 aircraft built. On 26 July 1991, PZL-104 Wilga 35A D-EWHN was seen at Flugplatz Magdeburg. The 1976-built PZL-Okecie PZL-104 Wilga 35A c/n 86233 was registered first DM-WHN in the DDR. In 1982, the aircaft was re-registered DDR-WHN. 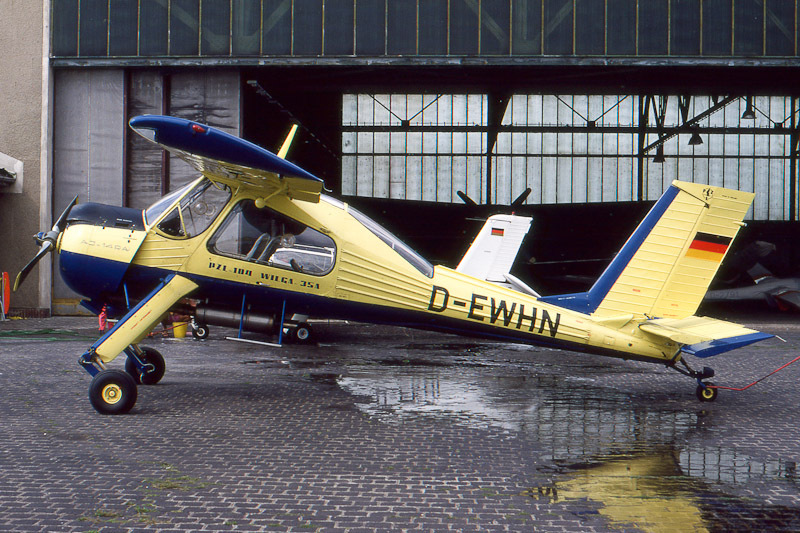 As of 3 October 1990, the East German DDR-prefix was no longer valid, and all active DDR- registered aircraft had to be reregistered, and on 25 April 1991, Wilga DDR-WHN was re-registered D-EWHN. On 14 August 2011, the aircraft was damaged beyond repair in an accident near Flugplatz Schönebeck-Zackmünde after the pilot lost control of the aircraft. The aircraft just towed a glider which released shortly before the accident. The pilot of the aircraft escaped with minor injuries. The glider landed safely.